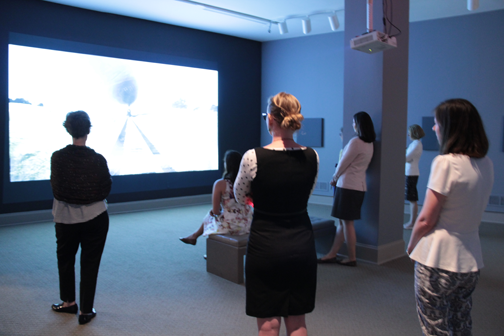 Last Thursday, NMWA members visited the museum for a sneak peak at our newest exhibition, Total Art: Contemporary Video. Member Preview Days are hosted by NMWA’s staff the day before new exhibitions open to the public. They provide members with exclusive access to each new show as well as access to special talks and programs. Highlighting the works of 10 contemporary artists, this exhibition is NMWA’s first-ever exhibition to focus primarily on video art. The exhibition features works by Dara Birnbaum, Kimsooja, Mariko Mori, Mwangi Hutter, Alex Prager, Pipilotti Rist, Michal Rovner, Margaret Salmon, Eve Sussman/Rufus Corporation, and Janaina Tschäpe. In order to accommodate all 10 works—with individual viewing spaces that provide optimal light and sound for each video installation—NMWA’s curatorial team redesigned and transformed the second floor gallery space. Newly constructed walls, sound boards, paint, and dimly lit spaces create a totally immersive viewing environment. To kick the day off, NMWA members gathered in the Great Hall for a tasty spread of refreshments and an opportunity to mingle. 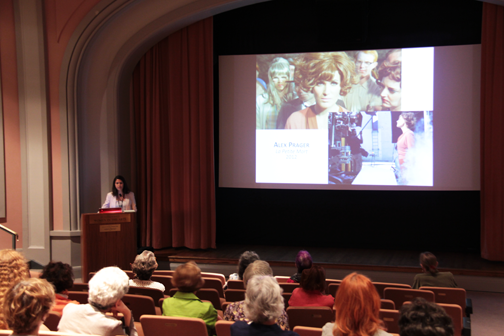 They were then treated to a special lecture by Chief Curator Kathryn Wat and Curatorial Fellow Rachel Gustafson. During the lecture, Wat discussed video as an all-encompassing art form that incorporates film, photography, choreography, and audio. This presentation allowed members to gain a deeper understanding of video art, one of the newest artistic mediums, and the impact it will have will have on art history. The curators provided context and background for all 10 works of art, giving members greater insight into the narratives and production methods. 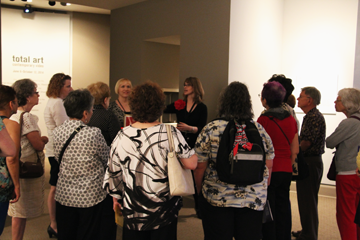 After the lecture, members enjoyed tours and group discussions led by the museum’s curatorial and education staff. During these sessions, members asked questions specific to each work and discussed their impressions of the avant-garde exhibition. Members were thrilled to have a behind-the-scenes perspective on this cutting-edge medium. Throughout the day, members were treated to 20% off purchases at the Mezzanine Café and the Museum Shop. Members also had the opportunity to explore NMWA’s collection galleries and receive a free gift from the Member Relations Department before they departed for the day! Would you like to take part in the next batch of Member Preview Day fun? Join today, and visit the calendar for a list of upcoming events. —Olivia Zvara is the member relations intern at the National Museum of Women in the Arts. This entry was posted in News and Updates, NMWA Exhibitions, NMWA Members by Women in the arts. Bookmark the permalink.